Rose Pengelly’s father has been ruined – plunging Rose and her mother into poverty. 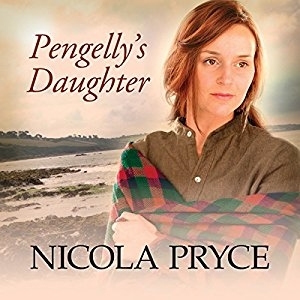 There appears to be only one way out of their terrible circumstances: for Rose to marry Mr Tregellas, a powerful timber merchant and the man Rose believes responsible for her father’s downfall. He has made his terms clear: either she marries him or faces destitution. Desperate, Rose sets out to find evidence of Mr Tregellas’ wrong doing. In her search, she encounters a mysterious young sailor called Jim, who refuses to disclose his true identity. Even as she falls in love with him, she questions who he really is. He may help her restore her fortune and her good name, but does he ever tell her the truth? Cornwall: 1793. It is a year of turmoil: England is at war with France. Mr Pitt’s government is frightened that radicals and dissenters will join forces with the Jacobins to encourage riot. It is not the time to be at odds with those in authority and not the time to be a woman faced with an unenviable decision. Yet, Rosehannon Pengelly has just three weeks to make her choice. Fosse and Porthruan cling to inhospitable rocks on opposing sides of the river. The river is deep, the harbours sheltered, the small, terraced cottages rising steeply from the quayside. Boats tie three abreast against the bustling town quay while huge ships lie at anchor, waiting to catch the tide. It is not a place to be alone at night. The taverns spill over; sailors spoiling for a fight. The press gang are watching, the dark, twisting alleys anything but safe. It is no place for a woman, no matter if she’s dressed in men’s clothes. 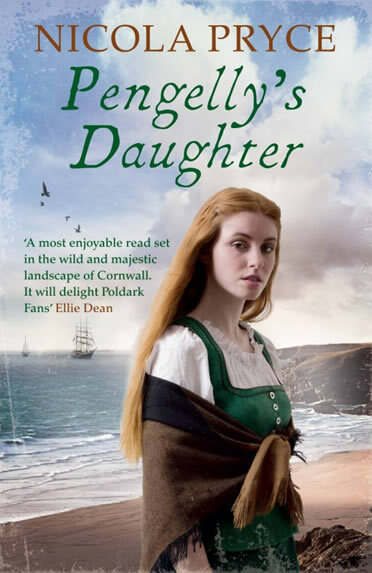 Brought up as the only child of a dissident boat builder, Rosehannon Pengelly has learnt to question the society within which she lives. Her father has installed in her a sense of injustice, the voting system needs to be addressed; rotten boroughs are rife, bribery and corruption, the norm. But where did it get him? His once prosperous boatyard now boasts another’s name. Bankruptcy and ruin leave Rose and her mother among the most vulnerable in the town. An advantageous marriage would change their circumstances, but to marry a man you believe to be behind your father’s bankruptcy? Rose has no-one to turn to and no-one to trust – certainly not the dark sailor she stumbles upon in the moonlight. ‘But what are words when actions speak so much louder? The knot in my stomach gave one further wrench. He said nothing, but his hands went straight to his chest, pressing against his heart. I remembered the gold chain, the beautiful ring that had shone with such brilliance and the taste in my mouth turned sour. There are some things a woman need not be told. Cursing my weakness, I turned quickly away, walking briskly back through the undergrowth. ‘I sat in the stern as he rowed me back. I should have sat in the bow where our eyes could not meet. I should not have watched the grip of his wrists, the pull of his muscles. I should never have imagined the touch of his hands or watched the toss of his head or the tightening of his mouth. 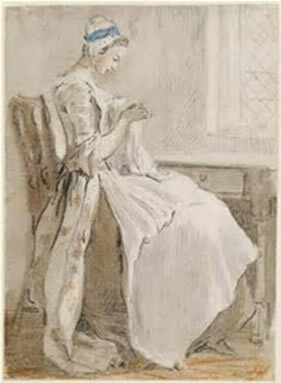 At the end of the eighteenth century, the trend towards simpler gowns was accompanied by lighter fabric. Heavy satins and silks gave way to muslin, cambric and linen. White and lighter colours became fashionable – as did sprig and spot patterns. Heavy gowns often required input from tailors, but these lighter fabrics were more manageable and many seamstresses set up as dressmakers. During the French Revolution, French dressmakers followed the émigrés and my character Madame Merrick is one of these. Politically, it was a time of bribery, corruption and patronage: no secret ballot and jealously guarded voting rights. A small town like my fictitious Fosse could send two MP’s to Parliament while large expanding towns like Manchester could send only one. Votes could be bought and controlled; properties left empty. The promise of contracts and lucrative positions were given only to those who voted for the right person. Sir Charles Cavendish MP is one such politician. Members of the Corporation held tight to their lucrative positions and for a shipwright to challenge them could lead to bankruptcy and ruin. 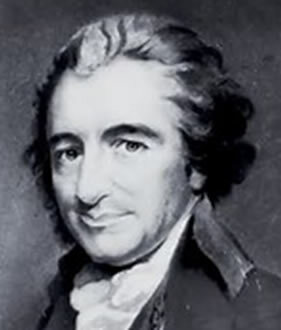 With the publication of Rights of Man in 1791, anyone supporting the views of Thomas Paine was considered a dangerous influence and my character, Pascoe Pengelly, a hard working but radical shipbuilder, pays the price for his dissident views. I have long imagined what effect a publication like A Vindication of the Rights of Woman would have had on a woman reading it for the first time. 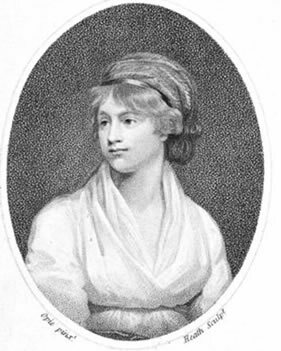 Rose Pengelly is heavily influenced by Mary Wollstonecraft and her desire to see women educated. After the American war of independence, British convicts were no longer sent to America but Mr George Moore, a London merchant and George Salmon, a prominent Whig, decided to ignore these new restrictions. Their ship, the Swift, sailed in 1784 with 104 convicts on board disguised as indentured servants. When I discovered this, everything fell into place and it formed the back ground to my novel.